Light tower maintenance starts with daily, weekly and monthly attention that includes visual inspections, fluid checks and safety procedures. These routines should be completed regardless of the season but may change along with the weather forecast. Colder ambient temperatures, as well as snow and ice, can create challenging conditions for compact equipment, but preparing for and adjusting to the conditions can help keep a light tower well-maintained throughout the winter season. Start each day by checking fluid levels, wiring and hose connections. Loose or worn wiring can lead to dangerous sparking or electrical short issues. Visually inspecting wiring from the control panel to the mast can prevent common electrical problems by simply tightening a loose wire, insulating a rubbing hazard or bending a wire away from a sharp edge. A visual inspection should also be conducted on areas that may need extra attention such as leaks, blocked air inlets and parts that may be susceptible to wear. Cold environments are particularly demanding on light towers due to the volume of air flowing through the machine. Airflow can also be an issue in colder climates where snow and ice can clog or freeze the air inlet grating. Inspect the vents and clear away blockages. Snow and ice should also be removed from the exterior and mast of the light tower as the extra weight can affect the stability of machine. A simple two-minute inspection could save hours of downtime to replace or repair an issue that could have been avoided. The trailer of a portable light tower is another maintenance area often overlooked. Check the tire pressure and tread, rotate the tires regularly, maintain the braking system and ensure the trailer lighting is functioning properly. In areas where roadways are treated with a salt brine solution for snow and icy conditions, regularly power wash the underside of the light tower package and trailer. Check for signs of corrosion. The trailer-to-vehicle lighting connector, tow hitch and jack stand may need special attention, as these pieces of equipment are exposed to excessive wear and tear on jobsites and in transport. It’s a good practice to replace these parts when worn or damaged to avoid a potential safety hazard. Shorter daylight hours can increase demand for light towers in the winter months. In some regions of the country, however, winter weather conditions can also bring work to a halt. In these instances, it’s important to ensure a light tower is still being operated on a regular basis. A light tower that remains inactive for an extended period can experience several issues that could damage internal components, including moisture buildup and fuel degradation. Over time moisture buildup causes water to settle near the bottom of an engine. When the engine is cranked, it ingests oil from the bottom first. If that oil is displaced by water, the engine will experience performance problems. Moisture buildup in fuel can develop into algae growth, which leads to catastrophic failure if ingested by the engine. Starting up the light tower and running at full load for several minutes at least once a month allows the machine to reach normal operating temperature. This causes any moisture accumulating in the fuel or oil to be converted to steam and expelled through the crank case breather. Regular operation in the colder months can also help discourage small animals and rodents from building nests inside the light tower box. Water entering the fuel pump and injectors is a major cause of diesel fuel injection system failure. Doosan light towers are equipped with a fuel and water separator that decreases the risk of water contaminating fuel and the high cost and downtime associated with fuel injection system repairs. The fuel and water separator should be manually drained daily, especially during colder months when the risk of water freezing is higher. Open the small valve located on the separator unit to easily drain excess water that has been collected at the end of each workday. A monthly battery test is a good rule of thumb, particularly when a cold weather stretch is expected. Batteries are sensitive to temperature and may not maintain a sufficient charge in cold weather. 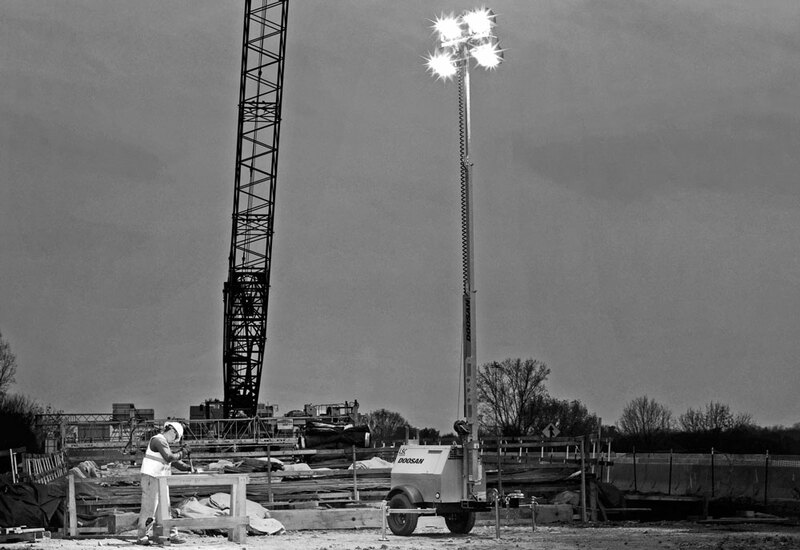 Fewer daylight hours in the winter months means light towers are essentially required equipment on most jobsites. Forced downtime caused by a dead battery in the machine can be avoided with a simple metering test before delivering a light tower to the jobsite. Adding capacitor testing to a regular maintenance routine for light towers can prevent downtime and costly loss of rental income due to a low-cost component. Capacitors can deteriorate over time and are susceptible to cold temperatures. A low capacitor rating is one of the most common causes of inoperable light towers and can be avoided with a routine test at the start of the winter season. A capacitor rating is measured in microfarad, typically denoted by μF shown on the capacitor and on the part number description in the Parts Manual. Capacitors that measure more than 1 μF (or ±5 percent) below or above the specified rating can result in inoperable lamps. For example, a capacitor measuring 23.2 μF would be more than 1 μF (or 5 percent) below the requirement of a 25 μF rating and would need to be replaced to ensure proper light tower operation. The primary purpose of routine maintenance is to extend the life of the light tower. One of the best ways to ensure performance is to use genuine manufacturer aftermarket parts. OEM filters and fluids are often tested during the development of the machine, so the manufacturer has confidence the filters and fluids will perform adequately. For example, the Doosan Portable Power testing process includes a cold chamber assessment that requires a machine equipped with aftermarket parts to adequately perform at subzero temperatures. Using off-brand filters and fluids introduces unknown variables that could affect machine performance and, potentially, equipment warranty packages. When a light tower has been properly prepared and maintained throughout winter, the benefits are clear. It will continue to deliver on reliability, performance and productivity into the spring, summer and fall. Jamie Jackson is a technical writer for Two Rivers Marketing.